This is a proposal by Peter Brassard, who comments here and on Greater City: Providence. It was published on Greater City first, and is mirrored here as the site is experiencing server problems. A variation to a commuter rail or shuttle train is the German S-bahn or French RER or San Francisco’s BART. An S-bahn type system is usually the same as commuter rail in suburban areas, but differs when it’s within the central urban core, where it has characteristics of a subway or metro. Usually stations within the core zone are located close together at quarter- to half-mile subway station distances and schedule headway times typically fall somewhere in the middle of commuter rail and subway schedules. Depending on the city, central core rail infrastructure can be underground or at grade utilizing existing rail corridors. A hybrid of a shuttle train and an S-bahn might best for Rhode Island. One way to organize Rhode Island’s rail system would be to create different station tiers allowing for various levels of service and investment in station infrastructure. Tier service levels could be thought about as intercity or express (Amtrak), regional or limited (MBTA), and local (RI Shuttle trains). Shuttle trains should be able stop at all stations and MBTA trains should have stops at major commuter and Amtrak stations. The hours of operation of a shuttle train should extend to weekends and late evening at all stations. 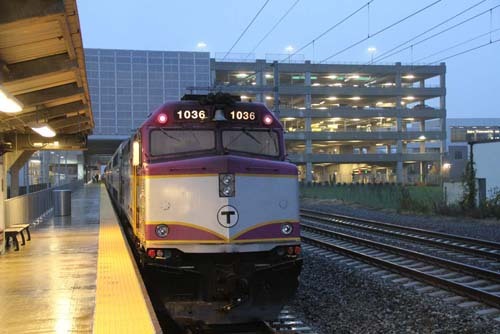 Because a shuttle train schedule would be frequent and regular, it would relieve the need to increase the number of MBTA commuter trains for Rhode Island transit needs or having to extend MBTA weekend service south of Providence. Infill stations could become catalysts to renew employment opportunities in older industrial neighborhoods, reinforcing economic development. Less advantaged people from urban neighborhoods would be able to commute without needing a car. 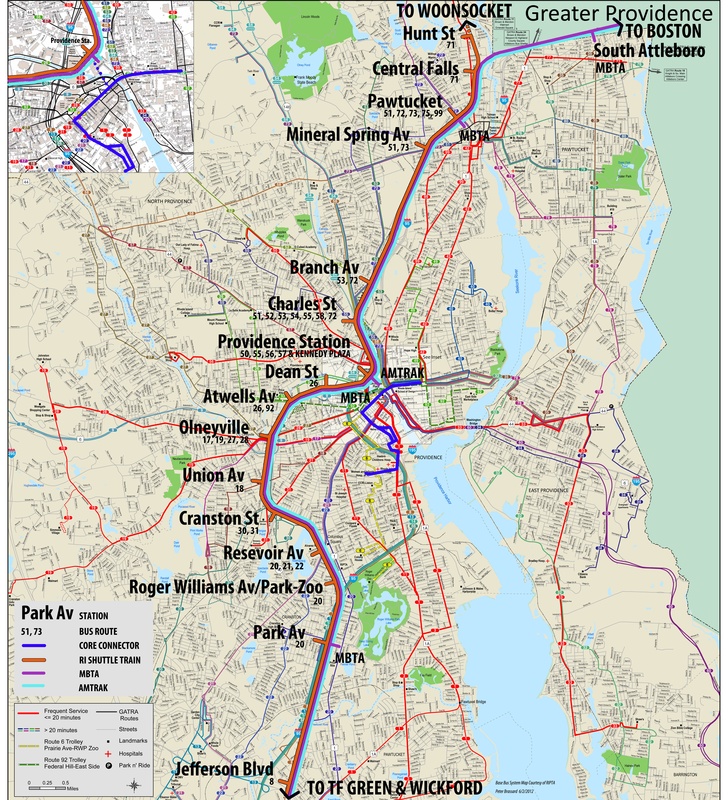 A series of stations served by frequent shuttle train service would create true rapid transit for Rhode Island passengers to quickly reach jobs or homes in adjacent cities or distant neighborhoods, not possible with the bus system. The increased use of commuter/shuttle trains would reduce traffic congestion and lower air pollution. Opportunities to concentrate additional employment and population around stations would help to limit the expansion of suburban sprawl. There is historic precedence of having closely situated train stations within Providence documented on city maps from 1918. (Link 1) (Link 2) In addition to Union Station, previous train stations existed at Atwells Avenue, in Olneyville at Westminster Street (northbound) and Dyke Street (southbound), Cranston Street, and in Elmwood. There are likely other forgotten stations outside of Providence. I remember being told as a boy that my great-grandfather would regularly take the train to Providence from Woodlawn in Pawtucket. As late as the 1960s there were the ruins of a wooden stairway leading down to the tracks at Lonsdale and Mineral Spring Avenues. Currently proposed urban infill stations are 300 Barton Street in Pawtucket, Olneyville, and Park Avenue in Cranston. Other potential infill stations could include Central Falls and in Providence at Reservoir Avenue, Cranston Street, Atwells Avenue, and Charles Street. Also Hunt Street, Mineral Spring Avenue, Branch Avenue, Dean Street, Union and Roger Williams Avenues could be considered. Suburban industrial infill stations could be built toward the northern end of Jefferson Boulevard and Davisville/Quonset though these locations might require additional bus shuttle service. There would be infill station opportunities with the Lincoln and Cumberland villages along the Blackstone River, for when train service would be extended to Woonsocket. A station at Route 116 with elevators and escalators reaching to the Washington Highway bridge deck would allow passengers to access buses to Lincoln and Smithfield’s office region. For details, see this map, overlaid on a RIPTA bus map. It shows potential shuttle train stops within walkable urban neighborhoods. Distances between stops are generally at half-mile intervals. RIDOT has two alternatives, option “A” and option “B,” for a Pawtucket/Central Falls infill station. Pawtucket officials and RIDOT favor the 300 Barton Street location for a Downtown Pawtucket station. Fewer people would be within walking distance of this station, but bus service would expand its passenger capture area of roughly 13,000 to15,000 people. The lower western quadrant of Central Falls would be walkable to this station. Development opportunities would be great for Downtown Pawtucket. RIDOT/VHB’s proposed 2009 Option “A” plan would be preferable, as both proposed station platforms would have direct access to Dexter Street’s sidewalks and buses without requiring a special drop-off circle for buses within the parking lot. Option “B” should be rejected as it isolates the station creating a condition favorable to automobiles and access to Dexter Street would be indirect and circuitous for pedestrians, which might limit opportunities for smart growth development in Downtown Pawtucket. The current plans to include a parking lot and vehicle drop-off area, though expensive should probably remain, since Pawtucket is a regional center and would be a major MBTA station. In the future the current proposed parking lot could be upgraded to a multi-level structured facility. Maximum interconnectivity to multiple stations with a large potential passenger base is the key to creating a robust rail system. The current blueprint for Rhode Island commuter rail is limited. To revive older neighborhoods and improve the state’s economic base, the rail system should serve more than just Providence and Boston commuters and intercity train travelers. 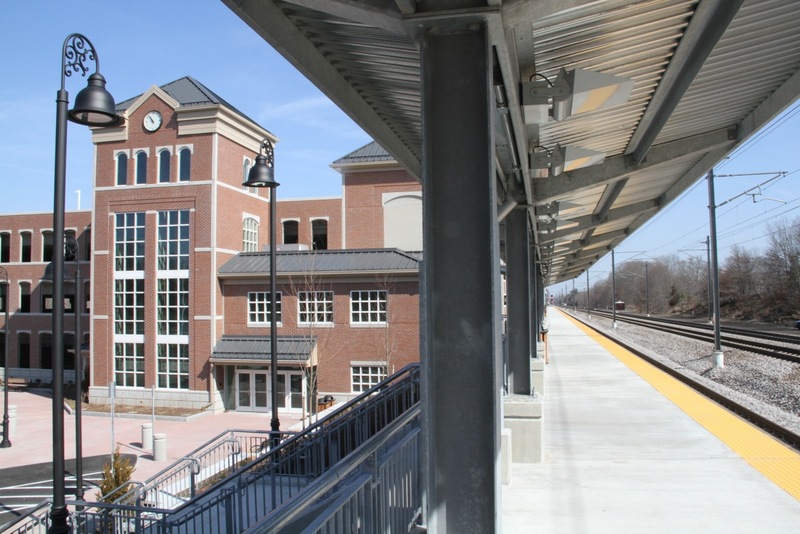 Providing a handful of expensive commuter rail stations, most of which in low-density suburbs, is not enough to substantially increase commuter train ridership and insure the success of the system. It would have to be confirmed, but it’s likely that between Central Falls and Cranston there are 100,000 people that could reach the rail line by a short walk or bus ride. What vehicles would this use? Would they be electric powered? How fast would they accelerate? Very often commuter rail has widely spaced stops because the cars’ slow acceleration means that there is a high time penalty for each stop. How are you dealing with this issue? Non-compliant DMUs, for through-service to Woonsocket. One issue that any Rhode Island regional rail proposal has is the distance from Providence’s main train station to downtown—although it’s an okay location for intercity rail, for commuters it’s less convenient. With the caveat that I’ve only passed through Providence, it seems like the station’s far enough and downtown parking’s ample enough to make regional rail uncompetitive with the automobile for choice riders (plus, the city’s so small that it’s hard to imagine it having enough congestion to make car travel inconvenient). Might a short, ~1.2-mile detour tunnel with a station under Kennedy Plaza, exchanging Amtrak an Amtrak connection for shorter walks and better RIPTA bus integration, help matters? Or would the cost (especially if ventilation’s not an option, though something like SNCF’s B 82500 electro-diesel MUs might work okay) outweigh the benefit? My bet is it’s better to get a service running, and then look at ways to optimize it. Providence Union Station is, as a whole, too small, and the current (E-W) track approaches too curvilinear to support faster trains. While it’s north of the traditional downtown (Downcity IIRC), it is close to Providence Mall–the city’s de facto retail center–the Rhode Island State House, and a new residential neighborhood. Once decent service starts getting going, and once (if?) major improvements occur on the NEC, we could probably start talking about a cutoff/bypass tunnel running N-S under Union Station, along with a smaller second stop on the south side of Downcity. Providence Station (not the same as Union Station, which is an older, demolished station closer to Downcity) isn’t really next to anything. Yes, it’s close to the mall and the state house, but it’s difficult to walk to them. Crossing the street next to the mall is possible but difficult without long waits for the pedestrian phase of the stoplight cycle. There’s also no street-level retail except at the mall itself, and this makes the walk dreary. The residential development is new condos geared toward Boston-bound commuters; there’s no street-level activity, again. I don’t know to what extent people in other neighborhoods of the city go to the mall, but on the East Side, people for the most part shop in-neighborhood. The mall is only for things that aren’t present in the neighborhood, such as upscale clothing. Thayer Street stays open hours later than the mall, and RISD students have only recently started going downtown at all (Brown students still don’t). Does (or did) Amtrak use the Acela tilting feature on the NEC in Rhode Island or Massachusetts? Yes. They do not use it in Metro North territory. Having used Amtrak and the T to Providence and then walking to Kennedy Plaza to use RIPTA service, I have to say that I see common complaints about how far the Providence station is from downtown, but it isn’t really that bad. It’s just a few minutes from the station to downtown, I really don’t understand the problem. In relation to this articles, great post. Essentially, we are talking about instituting the old interurbans in RI, correct? Alon, you say DMU, but why not EMU considering the majority of electrification is in place? It’s not so much about getting from the train station to Kennedy Plaza as it is about getting to the I-195 redevelopment area, the Jewelry District, and the South Providence hospitals from the train station. For an occasional traveler it’s fine, but commuters tend to be very sensitive to the destination end of their work trip—in a city as small as easy to drive around as Providence, a longer walk or streetcar transfer would keep ridership lower than it would be in someplace like Chicago. Let me clarify. RI didn’t have interurbans, but they service you are talking about could be categorized as an interurban service. Has the author proposed to construct essentially shacks as the “shuttle stations”? If you want to offer a quality ride worth middle-class (not only captive poor riders’ market), the first thing you don’t do is build an almost make-shift shack near a train line with a design worth 1923 + ADA compliance. (2) the budget suggested can’t even account for a very basic safety and information system such as LCD panels, cameras and modern quad-gates with double fail-safe sensors where pedestrians would cross tracks. (3) any money saved on station construction with the gratuitous obsession of not being “car friendly” would be far outweighed by extra money needed for feeder bus services proposed to areas where virtually any passenger actually drives everywhere nowadays and would keep doing so. Modern park-and-ride facilities can increase ridership if the service provide good commuter service. Ditto for the obsession with “no drop -off zones”. Why should all transit projects adopt this “war on cars” mentality? It is not like the only feasible options are either a “don’t even think driving-to-train” or “station surrounded by 40.000 sq. ft of open parking”. Reading is fundamental: what precisely do you think the term “infill” means? It refers to adding stations to a set of already existing station. Which is what makes this “war on cars” interpretation so absurd misreading of the proposal. There is nothing here that says that ALL stations are exclusively walk-up platforms. The “modern park and ride stations” with drop-of zones are the EXISTING COMMUTER STATIONS, and the INFILL stations are IN ADDITION TO the park and ride stations, not instead of them. Hence the term “infill”. I think you can even have satellite close-to-major-road/highway stations, but then it is good practice to have some car capacity at any station. Doesn’t have to be surface, it can be underground or in the form of a multi-story garage. Why would it be “good practice” to spend additional money adding car capacity at EVERY station? If looking at the car catchments of existing commuter stations reveals a gap that can be filled in, then certainly, place an infill park and ride station, but if the purpose of the station is walking / cycling / bus pedestrian access, and pedestrian egress to destinations in a convenient walking radius, adding car capacity costs extra money while interfering with the station’s primary purpose. Spending more money on less passenger benefit is not optimal. It is not good practice to have private car capacity at every station. Why would it be? Yes, it is good practice to have a kiss-and-ride spot and a taxi spot at every station, as this assists the disabled and those with lots of luggage, as well as providing a convenience for other people who can “get a ride to the station”, and takes up very little space. Private car parking is another matter. Perhaps there should be a wheelchair space or two. If one builds infill stations, then the inter-station distances will be relatively small. If a station is a mile away from another, why would both need facilities for cars. Even for a kiss-and-ride it may be ok to just use the adjacent station. A policy of “adding car facilities as a standard practice” translates is a nicer sounding way to express the policy of “adding car facilities whether or not they are justified”, since one of its alternatives is “and adding car facilities where the benefit justifies the cost and the negative impacts on all other passengers”. The core task for infill stations on an existing intercity rail corridor that already has stations provided to serve the primary car catchments of the area is serving unserved pedestrian catchments along the corridor. Unless there is a 5km station spacing because of a gap between walkable neighborhoods, even the fundamental urban bike facilities such as bike lockers and air pump should rather be focused on the one in three or one in four stations that are the best cyclist access or cyclist egress locations. Which is how the above works out infill locations ~ even bus catchments are described in addition to the pedestrian catchments that justify the station. What “war on cars?” The only war is on walking. Drivers have the weapons, people on foot are defenseless. Let’s quit this hyperventilating about a war on cars. Do you live in the United States? Do you even see how lopsided it is out there? We have to beg even to get road planners to think about pedestrians, much less help them! And every step of the way someone stands up and cries that their precious car isn’t receiving enough subsidies. As Bruce pointed out, we’re talking about “infill” stations here. That means stations where there is valuable land that is or wants to have high-value uses. Parking is not a high value use. In the United States, regulations currently FORCE everyone to provide excessive amounts of parking spots if they want it or not. That’s not a choice. It’s compulsion. Modern park-n-ride facilities can only increase ridership in places where there was going to be no ridership in the first place. That contradicts the point of “infill” stations, because by their nature, they are in place which have ridership! Big parking lots have a downside in that they introduce additional traffic to an area (which needs mitigation) and they discourage two-way use of a station. When the only use of a station is so that everyone drives to it in the morning, takes the train downtown, and drives home in the evening, that introduces a ceiling on ridership potential. Such stations will always be heavily subsidized basket-cases. Do you realize that 40,000 sq feet is only room for approximately 200 parking spaces? If you think that’s a high end, think again. Heck, 200 parking spaces often gets tossed into stations that weren’t even intended to be park-n-ride here. Park-n-ride stations here can easily be 500 spaces, and quite often surpass 1000 spaces. That may make sense near highways outside of town where land is cheap and nobody goes otherwise. But inside of a city or a town? No way. 1. The line has no grade crossings. 2. See #1. Also, LCD panels and such are cheap; concrete slabs are expensive. 3. The middle class in cities with strong transit just doesn’t buy cars. Olneyville is not middle-class, and people there get old cars, out of necessity, and any transit that gets people out of their cars is going to get them to ditch them and rely on public transportation. The same is true of Pawtucket and Central Falls. And even in richer areas, walkable stations get more traffic than drivable stations; Houston, with an entirely urban light rail line, managed to get the highest per-km ridership and lowest per-rider cost of any new US light rail project. 4. If one wants to make traffic attractive for commuting traffic, transit needs to be there in the off-hours, too, to free people from the schedule. One of the reasons people in Tel Aviv get cars, and then drive them on weekdays, is the lack of weekend transit. That’s what the Germans learned, too, when they started reviving regional rail. Peak-only trains do not work when driving is an option, and in Providence, it is. Regarding the expense of concrete slabs, when London went to modify platforms on the Underground for DDA access (their equivalent of the ADA), they required that a masonry solution be designed which could be assembled “block by block”. This was partly so it could be assembled overnight (concrete takes a while to cure!) with a short closure. And partly so that it could be adjusted to deal with differing curves, slopes, platform widths, and various other local conditions. But it makes me wonder: under what circumstances is masonry cheaper than concrete pouring? I’m not sure rail systems in this country ever bother to price out the blockwork alternative when they’re pouring concrete. Just a side note, not all the urban infill station neighborhoods along this rail route are disadvantaged. Middle class neighborhoods include Auburn and Edgewood in Cranston and in Providence the Reservoir Triangle, South Elmwood, and parts of Elmwood. Also the Armory District in the West End and parts of Federal Hill and Silver Lake, which would be served by Olneyville. I’m not sure where your discussion of grade crossings is coming from, given that the “existing freight line” in this case is the fully grade separated NEC. Since the stations are gneerally where there is some kind of cross street, that already grade-separated street crossing can be used for connecting the two sides of the station. And in the Providence context, most of these stations are in sufficiently dense neighborhoods, and sufficiently close to Downtown, that it really doesn’t make sense to have park and ride facilities at any of them. In terms of the quality of the stations, I think even a shack is a significant upgrade from the currently predominant alternative, which is an 8 by 10 sheet of metal bolted to the nearest convenient pole. But seriously, I think the quality of the service matters more than the quality of the stations, so long as the stations can do their job well enough and feel safe. And ultimately, how well a station is maintained matters more than how nice it looked when it opened anyway. On (4), the point is to be attractive to more than just commuting traffic. A decent rapid transit service should be useful for all kinds of trips, not just 9-to-5 work trips. Moreover, a lot more commuters would choose to ride transit if they knew that they could get home if they need to work late. Oh, and I bet that all but the most delicate members of the middle class would much prefer a cheaper ride to lavish station facilities. A platform, a simple shelter structure and an information panel or LCD screen is more than sufficient at most stations. Look at the O-Train in Ottawa: all kinds of middle class people ride it, even though the “stations” are mostly just asphalt platforms and bus shelters. The Stadtbahn Zug (“Zug” is the name of a town, not the word “train”) ought to be a poster child. The new stops of the Stadtbahn Zug are indeed typical “infill” stations, and the distances between them is sometimes rather short. For example, Schutzengel is essentially just outside of the first switch of Zug station area. FLIRTs are a fine industrial product. Tier service levels […] regional or limited (MBTA), and local (RI Shuttle trains). […] a shuttle train could have fewer cars and utilize shorter platforms that could be extended in the future, reducing the initial infrastructure investment. But greatly increasing the cost of additional service with longer trains. I don’t think you save that much money with shorter platforms, once you bring in all the planning and construction equipment. station platforms would have direct access to Dexter Street’s sidewalks and buses without requiring a special drop-off circle for buses within the parking lot. The idea behind such shuttle services is not necessarily to lengthen trains when capacity is reached, but to increase frequency. That’s why you get along pretty far with 150 m trains (the equivalent of two FLIRTs in Richard’s Stadtbahn Zug example). (or in the US, that could be 3 GTWs). ~150m for regional rail sounds quite standard to me, so “utilize shorter platforms” sounds like 50m or 100m “that could be extended in the future”. And while increased frequency is always good, it costs money. If trains are full and money is found for additional cars, but not for additional drivers, I’d prefer longer trains. However, “being prepared” for longer platforms (which I would see for 150 m trains) but only build 75 m would not bring very much savings, as the fixed costs (set up the site etc.) are relatively high. And “being prepared” means that the raw builds are constructed, but maybe the final layer of bricks is not put in place, and maybe some more of the electrical equipment. Mind you, my own conception of Boston-Providence and Providence-Woonsocket trains has the latter making more stops between Pawtucket and Providence, yielding the same three tiers of service. Whether it makes sense to have three levels depends on whether the infill stations make sense, since the MBTA South services have to cater to the intercity Boston and Providence commuters, and so shouldn’t have so many stops. And AFAIU it also should be FRA heavy-rail compliant. The Providence Foundation 2009 study of an Intrastate Commuter service has 7 stations for Wickford to Woonsocket, and with FRA-compliant DMU’s that is a run of about ~37min. If non-compliant DMU’s are feasible for the intrastate service, that’s what permits the tighter stop spacing. The problem with FRA-compliant DMUs: they’re expensive and unreliable. The performance difference between the Colorado Railcar and the Talent is not all that big – it’s smaller than the difference between the Talent and the Silverliner V. The real issue is that the CRC requires much more fuel to run, wears the tracks more, isn’t very reliable, and is single-sourced. The Providence Foundation’s study is probably the best that can be done under present-day regulations, but a Talent or a GTW could achieve the same travel time between Woonsocket and Providence with 5 more stops. Clambering up to the platforms in Providence is going to put a crimp in ridership. Or leaping down into the cars, whichever way you want to look at it. The Wikipedia machine says that the Talent comes in both high floor and low floor variants (and diesel mechanical, diesel hydraulic, diesel electric, electric, and tilting). and Wikipedia also says “in the variants with 800 mm and 960 mm floor height, the floor is flat from the first door to the last” The platforms in Providence are standard NEC platforms, nominally 48 inches or 1220 mm. or roughly ten inch difference. It’s going to make most people uncomfortable and definitely not ADA compliant. If they can make it in variants ranging from 550 to 960 mm, they can make a 1220 mm variant. …and the all knowing Wiki is silent on the width. that six inch or so gap between the platform and the train will be a problem. or Rotem could slap a diesel engine under a Silverliner. Or instead of spending money to widen the cars and raise the floors you could just hang catenary and get some off the shelf Silverliners or off the shelf M8s. A small FRA-compliant DMU order? Sure, that’ll work. 6in/15¼cm? Sounds familiar. Bridging such gaps between train and platform with retractable steps is standard procedure. Like Bodø, only with car floor, step and platform at the same height. … or one could see whether there could be a Japaneses design to adapt, as low-floor is not an issue… or with the same reasoning British designs. What LIRR order for DMUs? We’ll see. A large order this ain’t, but possibly the LIRR could still get something reasonable. How much of reconsidering does the recent FRA waivers for Denton County’s GTWs initiate? I do not know. The GTWs are unusually expensive, which for small orders is an even bigger problem than performance, but it could be that the bidding happened before the waiver was finalized, and so the price already assumed heavy modification. I cannot claim to understand Providence development or transportation patterns well enough to evaluate any proposal. Providence seems genuinely odd to me. There are a lot of cities where you can get a vague sense of things from a Google map photo and reading the local blogs for a week. In Austin it’s clear what should be done even to an outsider; in Columbus it doesn’t take that long to figure out what makes sense. Providence is… non-obvious, at least to me. I don’t “get” it. It was only on my fourth visit to the East Side that I even discovered Thayer Street. At the time I wrote my original post about the city, after the second visit, I thought the main streets were Wickenden and Main, and maybe the Waterman/Angell one-way pair. I only discovered Thayer while walking north to Angell to see what it had, and I’d randomly picked Thayer as the street to walk north toward Angell on. Wow. So I guess I’m not the only one to whom Providence is subtle and non-obvious. That was a really interesting comment, Alon; thanks. In an email to me from the Rhode Island Association of Rail Passengers, it was suggested that proposing a single platform for a shuttle train would cause safety issues because of the various levels of train service/speeds and that the FRA probably wouldn’t even look at such a proposal. Also, Amtrak would require platforms in each direction (as in north and south). They further suggested that four tracks would be necessary due to the train service complexity in Rhode Island. The Providence rail corridor ranges from 57 feet (17.4m) to 65 feet (20.1m) in width. Alon suggested that “it’s actually less than the standard for HSR.” However, “it’s the standard for medium speed (which is fine; there’s no point in designing the track within Providence for more than 100 mph). . . . Alternatively, depending on traffic, it’s still possible to run regional rail and HSR on the same tracks. But that involves a compromise about the number of stops (more stops = more speed difference between commuter and intercity rail) and frequency (more than once every 15 minutes is impossible). That said, if there’s HSR and traffic demand for that is more than once every 15 minutes, then the profits would be enough to four-track everything.”. . . The Providence area started out with a four-track corridor. What complicates just adding another track is that when Rhode Island’s segment of the NEC was electrified in the 1990s, new tracks were installed off-center to provide for the tilting feature on high-speed trains. Following a third track was built for freight that reinforced the same lack of foresight to anticipate future multiple uses. Also new bridges have been built since the electrification with off center columns particularly in the Olneyville area. It should be possible to utilize the three existing tracks for an initial phasing of urban infill stations with inbound and outbound platforms. Perhaps my map could be adjusted so that there would be fewer stations with greater distance separating them, when possible. Instead of a half-mile (0.08km) between stations the goal should be a mile (1.6km).